Created in April 1997. Tropic Lightning was inspired by the 25 Infantry Light Division located on Schofield Army Base in Hawaii. The Tropic Lightning Division tour of duty included Iraq and Afganistan. Taekwondo pursues harmonious growth and improvements in life through dedication and pursuit of perfection. 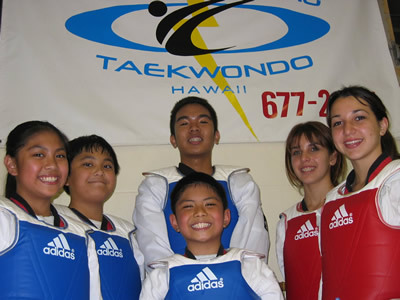 Here at Tropic Lightning Taekwondo, we have a martial arts program suited for students of all ages. For children, our priority is on character & self esteem development, mental endurance, physical fitness, and martial arts discipline. For the adults, our goal is to convey the benefits of taekwondo, which includes improved muscle tone, increased cardiovascular fitness, lower stress levels, increased energy, and greater flexibility. We at Tropic Lightning offer a curriculum based on the Olympic World Taekwondo Federation style of Taekwondo. Competition is also emphasized but not mandatory. Training sessions are supervised by qualified instructors who are committed to teaching the physical skills of taekwondo in a positive way, to bring out the best character, and physical potential of each student. Under our belt promotions our students are certified under the Kukkiwon. Our facility is located in the heart of Waipahu on the island of Oahu, at the Westgate Shopping Center on the 2nd floor.